The first 5,000 league commissioners to create and complete their AFL Fantasy Classic or Elite league by 23:59 (AEDT) on February 28, 2016 will receive an extended free trial of AFL Live Pass ending April 26, that commences when the AFL Live Voucher is activated. If the user does not cancel the subscription prior to the 26th April, it will automatically roll on to a paid weekly subscription charging the user at $4.99 a week thereafter. The extended free trial of AFL Live Pass is valued at $24.95 (including GST). So free for a month but paid for the rest of the year. From all Eligible Entries, the Eligible Participant who has scored the most points overall and is ranked the highest (calculated in accordance with the Rules) in each of the 18 Verified Club Leagues after the completion of the Home and Away season, will be determined the winner. The club Guernsey won will correspond to that of the AFL Clubs verified league which the user has entered. The club’s verified league must also match exactly with the club that has been selected under the ‘who do you support’ drop down in the registration section of the game. Last edited by Elvs1; 2nd February 2016 at 09:45 AM. The 12-month subscription commences from when the AFL Live Voucher is activated, for the first time, by the winner. Live Video of every season game for the subscribed period. Full match replays of every 2016 Toyota AFL Premiership season game on demand for the subscribed period. The livepass thing still potentially worthwhile if they were to provide heatmaps for the NAB cup. Just having a look at some of the price differences between this and other comps, certainly not as drastic as in past years. Some rookies are much more expensive, but they're much closer than last year from those I recollect. Couple that are jumping out at me that may be more relevant in this format are Ryan Harwood (198k compared to 260k in RDT) and Hampton (227k in this, 279k in RDT). Harwood for example is virtually the same price as the Essendon Mitch Brown. No live pass means I'll skip it unless they've improved the overall product this year. I'll join others as the come up. At this stage I wont be putting effort into this comp though. Will play because I'm a victim, will not care though as usual. The pricing of players is so all over the shop, doesn't seem to really be any rhyme or reason in pricing. All the rookies being shadowed out because they haven't added a photo looks very cheap. You'd think they'd get that sorted before roll-out. Tom Mitchell is priced at $593K and averaged 106.65. Meanwhile Armitage averaged 107 and is $1000 cheaper. That is whack. Slapped this up quickly. 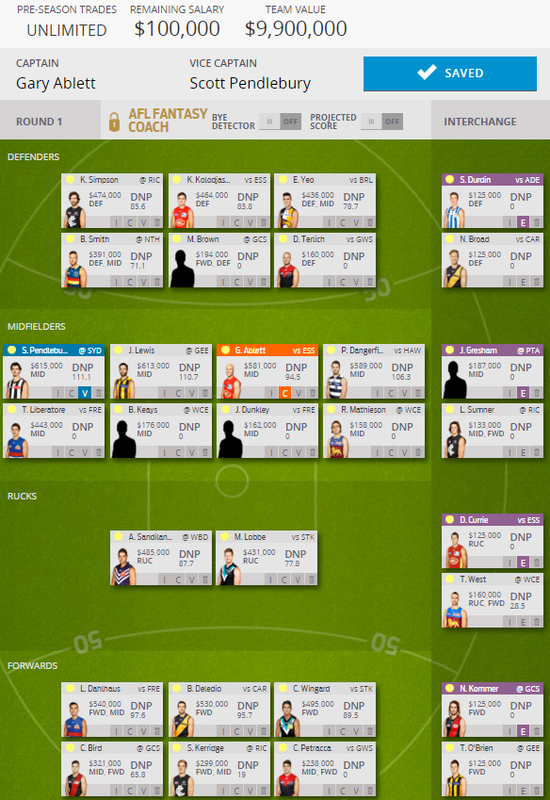 Not going to with either Goldy or Martin with the trade system lolfantasy have I'll get them when the become cheaper. Love how they've priced Kerridge, avg 19 as basically the same as Bird with the 66 average!